When I thought of Great Expectations, I used to think of Miss Havisham first. She shrouds herself in bridal rags, sitting next to a rotted bridal cake, with one bridal shoe in hand. She is wreathed in disappointment and bitterness to such an extent that the only thing she can teach her adopted daughter, Estella, is how to exact revenge on men. But this time through Great Expectations, I was absorbed in the men. How curious it is that Pip’s legal guardian, Jaggers, finds it necessary to be so scrupulously clean. His cleanliness is purely of an external nature, not an internal one, for he is far removed from the people whom he serves as lawyer. He seems to care not at all about the outcome of their cases as long as he can keep himself free of the dirt and scandal. How ironic it is, then, that he advises Pip,”Take nothing on its looks; take everything on evidence. There’s no better rule.” (p. 180) Poor Pip is unable to do that. He looks at his great fortune with great expectation, that being a London gentleman will remove the shame he feels of being “common and coarse”. And in running from common and coarse, Pip dismisses honorable and true. For who is the noblest, the strongest, the bravest and best man in all of the novel? It is Joe, the man who minds the forge in town, standing before his anvil wearing a leather apron and an undaunted spirit of courage and grace. 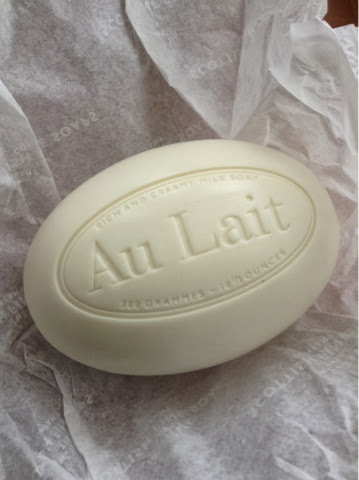 How is it that we make ourselves “clean”? Surely not from the outside. No amount of soap can give Jaggers, or Pip, or any other male character in Great Expectations the purity we find in Joe. One forgets, upon opening Dickens’ A Christmas Carol, that Scrooge is visited by four ghosts on Christmas Eve. The first is his partner, Marley, who tells him, “I wear the chain I forged in life…I made it link by link, and yard by yard; I girded it on my own free will, and of my own free will I wore it. Is its pattern strange to you?” Immediately we are confronted with the image of bearing what we have ourselves created, a string of good deeds or bad all connected and resting round our bodies. This is what I loved most about A Christmas Carol. Not the wonderful descriptions of Victorian England, which indeed feel more like Christmas to me than any other setting, but the way Dickens’ story caused me to reflect on my own life. The revelation of all the woe that one has consciously, or unconsciously, wrought begs only one question: “Assure me that I yet may change these shadows you have shown me by an altered life?” Because the hope of Christmas brings a new beginning, a new year in which to try to set things right. That is what I love most about this story, for it is a story of redemption. Once shown his evil ways, Scrooge wakes on Christmas Day, a bright, sunny, cheerful morning with a bright, sunny, cheerful heart. He is determined to make up for what he had failed to do in his stinginess and depravity; once shown the error of his ways, he now begins anew thus negating everything the Ghost of Christmas Yet to Come has revealed. 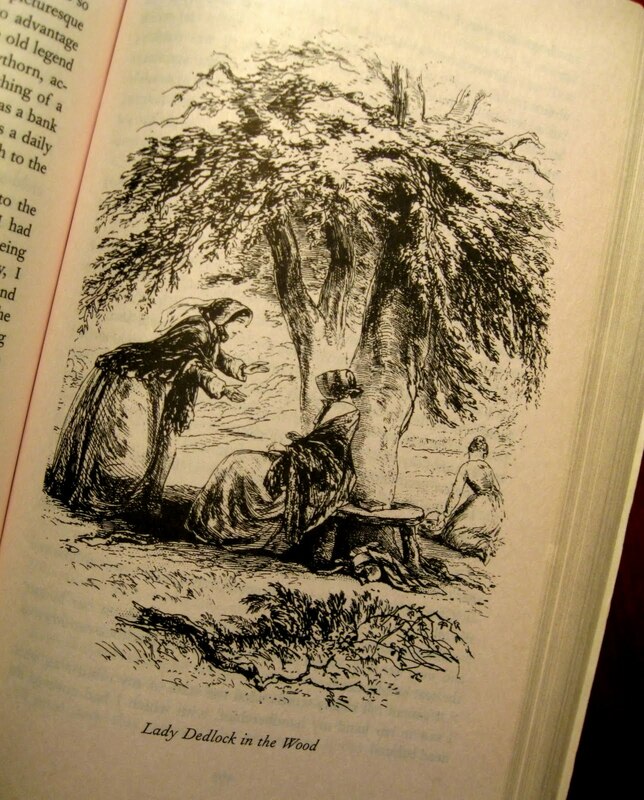 Just as I supposed: Lady Dedlock is Esther’s mother, and it is in this illustration above that they meet to discuss it on the Ghost Walk. I love Esther Summerson for her eternally bright optimism and goodness. I am reading this book for the Bleak House read-along hosted by Amanda at The Zen Leaf. 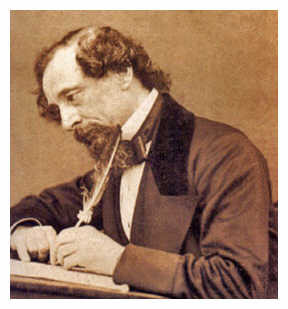 Dickens’ Writing: Can I Tell You How Much I Love It? “…only last Sunday, my Lady, in the desolation of Boredom and the clutch of Giant Despair, almost hated her own maid for being in spirits. She cannot, therefore, go too fast from Paris. Weariness of soul lies before her, as it lies behind-her Ariel has put a girdle of it round the whole earth, and it cannot be unclasped-but the imperfect remedy is always to fly, from the last place where it has been experienced. Fling Paris back into the distance, then, exchanging it for endless avenues and cross-avenues of wintry trees! 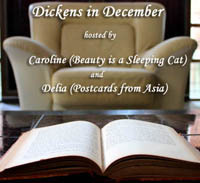 I am reading Charles Dickens’ Bleak House for the read-along hosted by Amanda at The Zen Leaf. It also qualifies for Carl’s RIP V. Perhaps you have time to join us? Expectations are a dangerous thing. Held in check, they encourage us to achieve great things. Given free reign, they can cause destruction as great as any other folly: pride, greed, or jealousy. 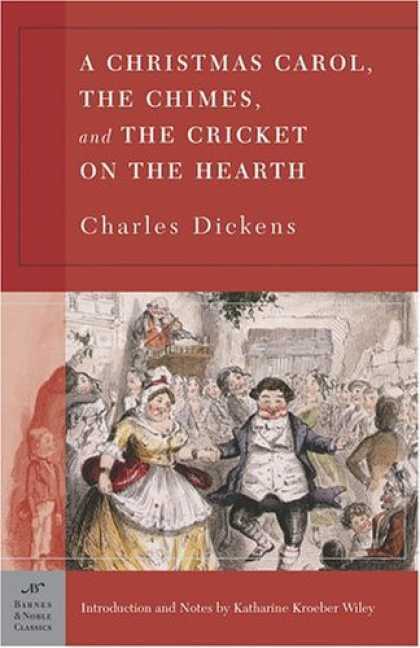 I was highly drawn to this book, not only because of it being a classic work of Dickens’, but because of the whole concept of expectations which consume his characters, and if I’m not careful, me. The book opens in a graveyard; is that not a fitting setting for the imminent destruction we will soon see? Our young hero Pip suddenly meets a convict, who has escaped from prison and entreats Pip to bring him some food and a file. Which Pip promptly steals from his sister’s home where he lives. In helping the convict escape, he has no idea of the return he will find from that one act of kindness. Unhappily living in his uptight sister’s home, with the exception of her husband, Joe, Pip believes his benefactress to be Miss Havisham. She is a woman who lives in Silas Manor, dressed in the very same rags which were once her wedding dress. Jilted at the altar, she has refused to step away from the expectations she held for her wedding day. She wears her wedding dress, holds her wedding shoe, has all the clocks stopped at twenty minutes to nine. Her wedding cake is covered in cobwebs, and her bitter heart keeps her from experiencing life any longer. In fact, she raises an adopted daughter, Estella, to be as bitter and vengeful as she herself has become. When Pip is told that he has come into a huge inheritance, and may freely live in London, he flees his humble home with hardly a backward glance. Never mind that he has turned his back on Joe, the one true friend and man of character that he knows; he’s off to fulfill his expectations for a grander life than being an apprentice blacksmith to Joe can ever provide. Assuming that his benefactress is Miss Havisham, he’s greatly surprised to find his financial endowment has come from the convict, Provis. He is also terribly saddened by the scorn with which Estella treats him, despite his love for her. It is not until the completion of the novel that he finally recognizes the scorn with which he himself has treated Joe. This novel gives us a chance to examine the effects of expectations on characters we are lucky enough only to observe. But, perhaps more importantly, it gives us a chance to examine our own expectations. Hopefully, we can draw an appropriate balance between too few or too many before we suffer their consequences. Find another review at Rose City Reader. 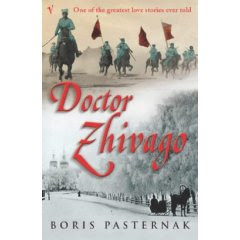 Dr. Zhivago by Boris Pasternak was completed in 1956, smuggled out of the Soviet Union in 1957, and first published in Russian in Milan at that time. It wasn’t until 1988 that it became published in the Soviet Union. Its 592 pages tell the story of The Russian Revolution of 1917, and the story of a man ((Zhivago) whose life is slowly destroyed by the violence of the revolution. It won a Nobel Prize for literature in 1958. I loved this book because no one was left unscathed by the ravages of war; it seemed universally applicable to any culture. 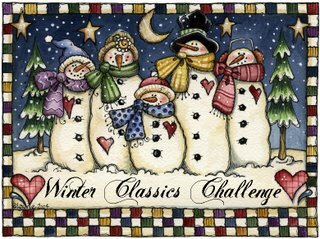 I also loved it for adding to my understanding of Russian history, for the beautiful setting in Winter, and for the portrayal of relationships. The movie, with Julie Christie and Omar Shariff, did not do this book justice in my opinion. A Tale of Two Cities by Charles Dickens is set in between the period of 1775, at the beginning of the American Revolution, and 1789, at the storming of the Bastille in France. It tells the story of Charles Darnay and Sydney Carton, both of whom are in love with Lucie Manette. The story slowly, slowly builds to an astounding conclusion of sacrifice, while weaving in the characters of Lucie’s father and Madame DeFarge who is a female revolutionary with a grudge against the Darney family. The whole time I was reading it my father was saying, “Madame DeFarge, knitting, knitting, knitting…” and looking at me with raised eyebrows and a laugh. It’s opening line, “It was the best of times, it was the worst of times…” remains among the most famous lines in English literature. This summer, I began working through the Pulitzer Prize winning novels, and California Teacher Guy recommended I read A Bell For Adano by John Hersey. It was first published in 1944, winning the Pulitzer Prize in 1945. It tells the story of the town of Adano, in Sicily, whose 700 year old bell has been taken down and melted for ammunition by the Fascists. The Major who comes to this town, and transforms it into a democracy, is a character I will never forget. He has a heart, does not abide by the rules for rules’ sake, and empowers the people with his laughter, acceptance and courage. This has to be one of my favorite books of all time. Main Street by Sinclair Lewis was also recommended to me by a friend. (Interestingly, it’s author, Sinclair Lewis, worked at one time as a secretary for John Hersey in the 1930’s.) Sinclair Lewis was not an author I was familiar with, although he may be best known for his novel Babbit. Main Street was first published in 1920, and was Lewis’ first commercial success. It tells the story of small town America in the 20’s through the eyes of a young girl named Carol Kennicott. She comes to the town as a young bride, where she is quite distressed over its dullness. She attempts to transform it into an intellectually stimulating “city” with no success, running into a “wall of bigotry, hypocrisy and complacency” every where she turns. I was personally startled at what I perceived to be her selfishness, leaving her husband to go to Washington for a few years (which reminds me of Anne Tyler’s novel in which the woman is sick of her family and just leaves to begin a new life somewhere else. Who, with any character is able to do that?) and pretending to be more than she really is. Again, this novel is applicable to many places today. Only, I’m trying to get our Now Huge Town small again. But, that would be egotistical of me, wouldn’t it? In conclusion: Classics are my favorite genre. They contain lessons, and people of character which I sorely miss in contemporary fiction. Their length gives me enough time to be fully absorbed in the story, and it’s almost with dread that I finish the last page because I’m so immersed. I found Winter to be the perfect time to curl up with a classic, especially the Russian ones with their setting of snow. So, thank you, booklogged, for this exciting challenge which made me feel I’d really accomplished something during my weeks at home recovering from surgery.